PUTRAJAYA: Malaysia, which has carved a name globally as the expert in halal matters, is confident of remaining as the go-to authority with the drawing up of a national halal policy. The policy, which is being drafted, entails certification, standards, accreditation, laboratory, research and development, and the growth of the halal industry itself. A paper was presented at the Halal Malaysia Council’s first meeting yesterday, chaired by Deputy Prime Minister Datuk Seri Dr Ahmad Zahid Hamidi. This was the first time the council had convened a meeting since it was set up in June 2016. 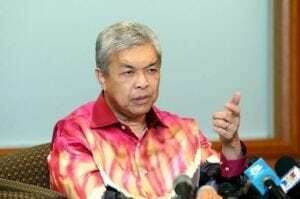 Dr Ahmad Zahid said with competition from Brunei, Indonesia and Thailand, efforts must be undertaken to ensure Malaysia maintains its position as the leading authority on halal matters. “Our know-how will not only open up opportunities for local entrepreneurs but will allow us to further promote moderation to every corner of the globe. That is why it is important for us to lead the way,” he said. The meeting also heard of achievements made to promote the country under the Halal Malaysia banner, with countries such as Japan, Saudi Arabia and China showing keen interest in its expertise and services. Among others, Malaysia has offered Japan to look into the preparation of halal meals for the Olympic and Paralympic Games to be held in Tokyo in 2020 while China welcomed Malaysia in developing a halal laboratory and certification for Yunnan. Dr Ahmad Zahid said the United Arab Emirates and Saudi Arabia were also keen to have tie-ups to develop a halal eco-system. Deputy Prime Minister Datuk Seri Dr Ahmad Zahid Hamidi says that Malaysia Halal Council will replace the Halal Industry Management and Development Special Cabinet Committee to address wider issues pertaining the halal industry.